Two days and a few hours before the Giveaway!!! So…? What are you waiting for? Just leave a reply to this message and you can win a Teesha-style journal plus ephemera and really cool paper!!! Friday Evening CET I will draw the lucky winner!!! Is it going to be you? 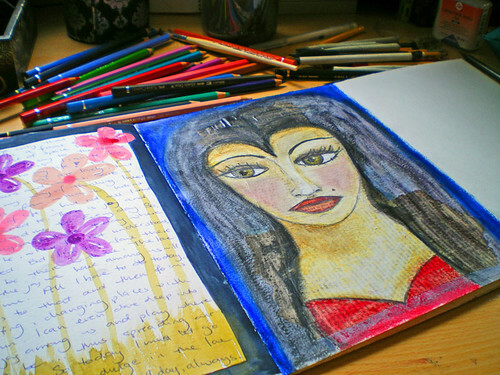 Then on to today…if you’ve been here before, chances are you know that I use my journals as an artistic laboratory too. I love trying out new supplies or new techniques. Today I’ve been messing about with some mixed media technique…a face. I was so busy mixing my media that I never noticed the right eye wasn’t quite level with the left one. I only noticed after I’d varnished the portrait…hehehehehehehehe….unintended silliness! But hey! Picasso didn’t get the eyes level either! Only a matter of time before people lay down millions for my journal pages. Huh! Hi…no, I don't think that comment has arrived here…didn't see anything come in…but your comment's here now…well in time for tomorrow's giveaway!!! I don't know how you can become a follower, though. I'm having trouble myself with following blogs…wordpress doesn't seem to work well with every blog type, or something…so, if any wizkids visit…any advice is welcome!